Summary: The Newbery Award-winning author of The Crossover pens an ode to black American triumph and tribulation, with art from a two-time Caldecott Honoree. Originally performed for ESPN’s The Undefeated, this poem is a love letter to black life in the United States. It highlights the unspeakable trauma of slavery, the faith and fire of the civil rights movement, and the grit, passion, and perseverance of some of the world’s greatest heroes. 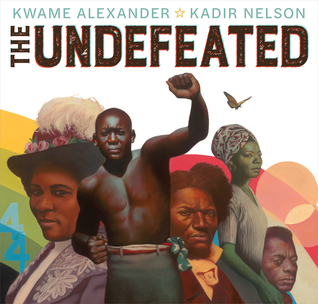 The text is also peppered with references to the words of Martin Luther King, Jr., Langston Hughes, Gwendolyn Brooks, and others, offering deeper insights into the accomplishments of the past, while bringing stark attention to the endurance and spirit of those surviving and thriving in the present. Robust back matter at the end provides valuable historical context and additional detail for those wishing to learn more. Ricki’s Review and Teachers’ Tools for Navigation: This is an incredibly powerful book. I loved seeing the poem (which was previously performed) turned into a picture book. The book touches upon many critical topics for youth to consider across time and place. It offers a strength that makes readers want to jump from their chairs to support the message of the text. This is a must-read. Teachers might use this book in classrooms by asking students to select a page that they find to be particularly inspiring. Then, they might research individuals who reflect the undefeated-ness that they see on the pages. This might devolve into research projects that explore the “faith and fire,” as quoted from the book summary, that students see across time, space, and place. How does this book make you feel? What do you perceive to be the author’s and illustrator’s purpose(s)? What similarities and differences do you see across the pages?